Although I actually visited Theler once or twice between my trip to Ocean Shores and last week’s trip to Fort Flagler, I didn’t get a single picture I felt a need to share, so, as far as this blog, this journal, is concerned I took two trips to the ocean in a row, though I went looking for very different birds. 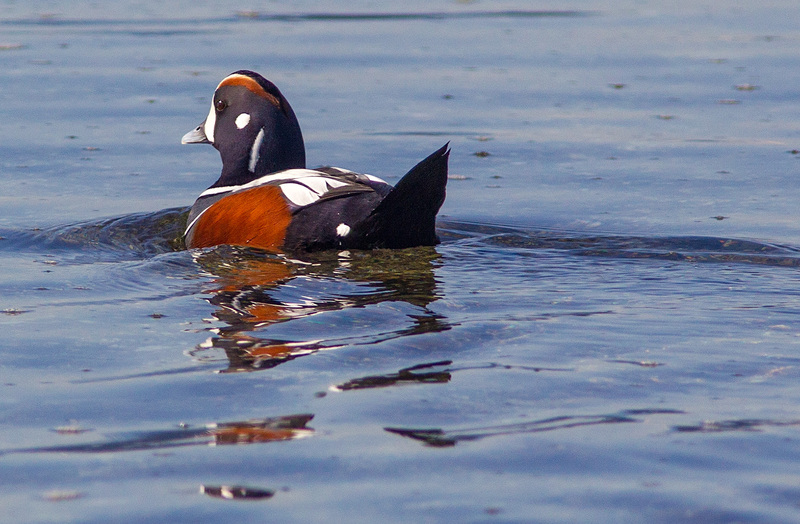 Fort Flagler has become my to-to-place to get my Harlequin fix. 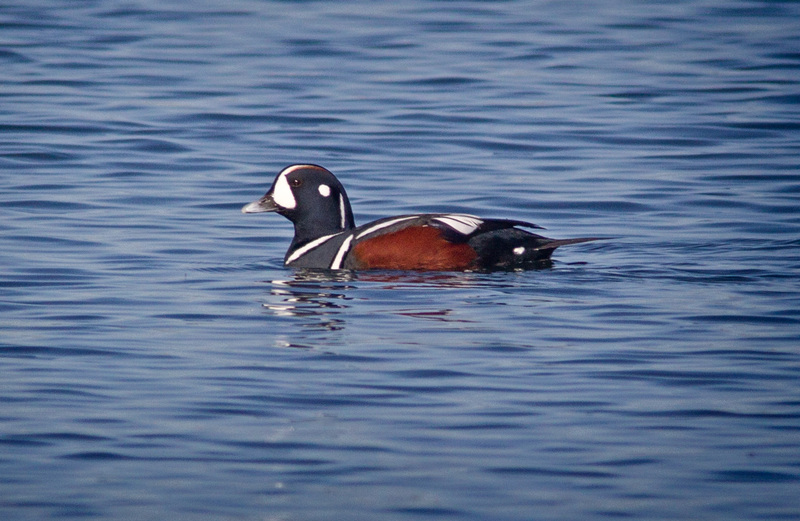 It’s the only place where I can count on seeing Harlequins, even if it’s only at a distance, any time during winter. They can sometimes be found nearby, but it’s much more of a hit-or-miss situation. Of course, seeing isn’t the same as photographing, but that’s part of the challenge that keeps me taking photographs. 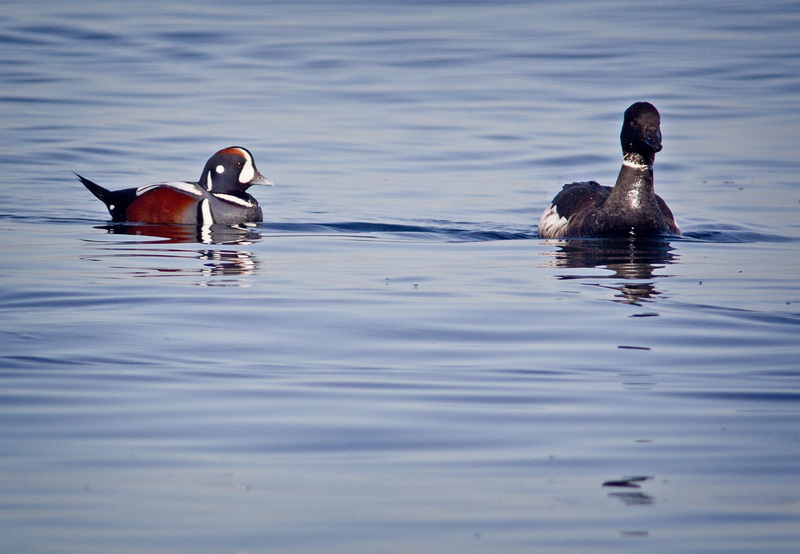 I saw an awful lot of birds before I spotted a Harlequin, and it was a long ways offshore. Luckily it was another beautiful, sunny day so I was able to capture some detail even though this shot is heavily cropped. Of course, when it’s dark and gray I tend to see them closer to the shore. 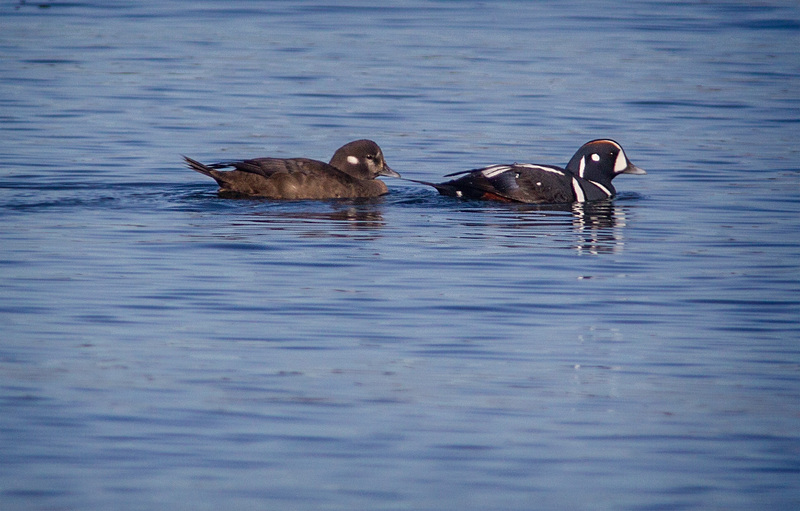 Although we walked back the same way we came, we saw more Harlequins than we’d seen earlier, though they were all considerably offshore, like this pair. Apparently emboldened by the Brandt, this guy came closer than any of the others had, though that still wasn’t very close. 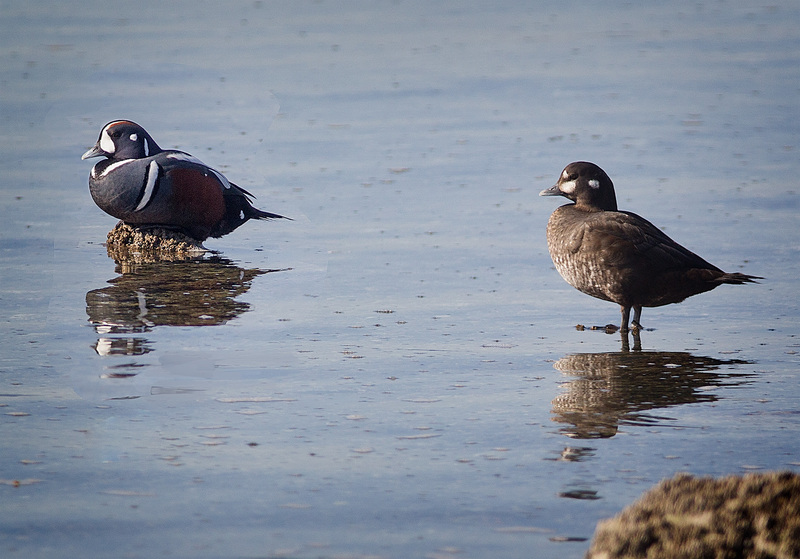 On the way home we stopped at another spot where I often see Harlequins and found this pair sitting quite close. These shots needed very little cropping, but unfortunately the sun was behind them, meaning you can’t see the brilliant reddish colors that set the male apart. reminding me of Theler’s Belted Kingfisher which revels in sounding a resounding alarm when I approach with a camera. I’d equated harlequins only with trashy romance novels until seeing these, Loren, so they are quite the revelation, even as I note, especially in the final foto, that these guys look almost unreal, as if you’d set a beautifully painted wooden version of one out on the lake and gave him a push to make a little wave so you could snap a live action shot! They are beautiful, aren’t they? Beautiful enough that I drive a long ways several times a year to see them.